To synchronize your external repository state with that of Amazon S3 object storage, you can use the rescan feature. By default, rescan is done automatically every 24 hours and synchronizes your external repository state with that of Amazon S3 object storage to fetch newly created restore points and other required metadata. Rescan is done automatically upon the addition of a new external repository to the application scope. 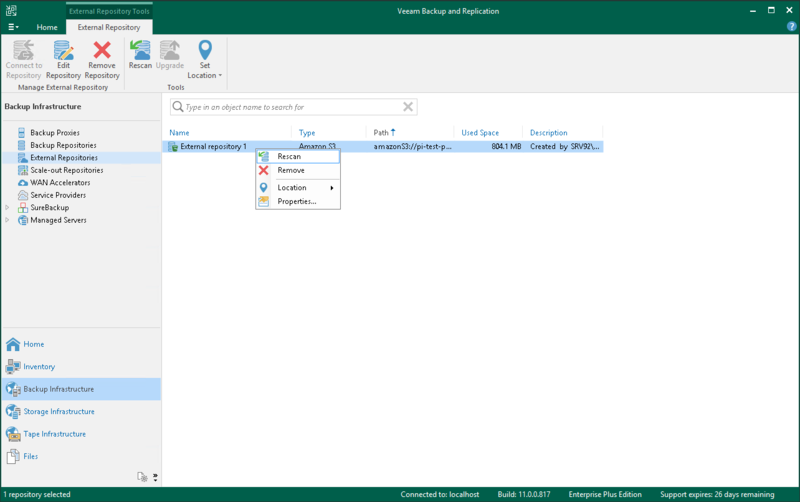 Rescan session results are saved to the configuration database and can be found in the History view under the System node. Select a repository you want to rescan and click Rescan on the ribbon menu or right-click a repository and select Rescan. If you have more than one external repository added to the scope, you may want to rescan all the repositories altogether. For that, right-click the root External Repositories node in the navigation pane and select Rescan.